This weekend I attended the annual loft tour of about 10 private residences organized by the City of Chicago. The lofts were magnificent and each so distinct in terms of style, from minimalist to a place filled with antiques! Most of them were converted spaces in old industrial buildings along Printer's Row, which gave them so much character and history. I've always loved lofts, and this tour only helped solidified my desire to own one some day! But I know they aren't for everyone. So, I want to know, could you live in a place with an open living plan, exposed beams, and concrete columns typical of loft spaces? Oh I absolutely could . . . these pictures are gorgeous! A loft tour sounds like fun! I would have loved to live in a loft before I had kids. Now that I have one toddler, and a little girl arriving in a few weeks, a regular house is definitely more practical. 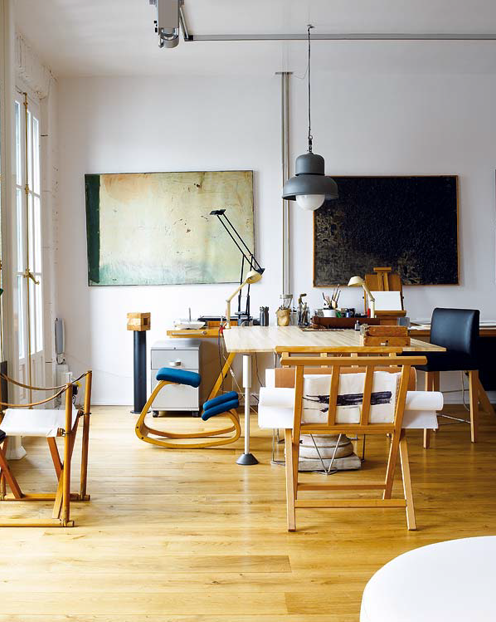 But lofts are great canvases for interior design with the high ceilings and open planned living. that tour sounds so amazing! I don't know...with two kiddos it gets pretty rowdy at my house, so maybe in my retirement...but I love the look and concept! I lived in a loft before,loved the light and open space.I'm an artist and the light is always "the must" to me!Amazing pictures! I love lofts and wouldn't mind living in one with my boyfriend. I think there's so much creative stuff you can do in such an empty space. But I'm still longing for that cute little house off a side road somewhere, where there's lots of light, rooms with built in bookcases, and a kitchen that's just a dream to cook in. Having a loft life is the dream! Excellent photos! Certainly could but the hubby would not! Love the first image more. What I'm wondering about is that lovely round stool in the top image. I confess I'm imagining it in fabric rather than leather, which may be contrary to the loft look, but I'm wondering who the designer is or whether it's a mainstream item I'm not aware of? Its lines are perfect, and I'd love to have one of my own. Lovely photos! I'm always looking for loft inspiration, i'm living in one now! You have to really pay attention to what furniture goes where I find... my space is pretty empty right now so i'd like to get decorating soon! I love the idea of loft living. There is an old abandoned school building locally that I adore. It's red brick and has the most amazing arched windows in the front. Oh what could be done with that building if anyone had the money. Your life sounds so fun and exciting! 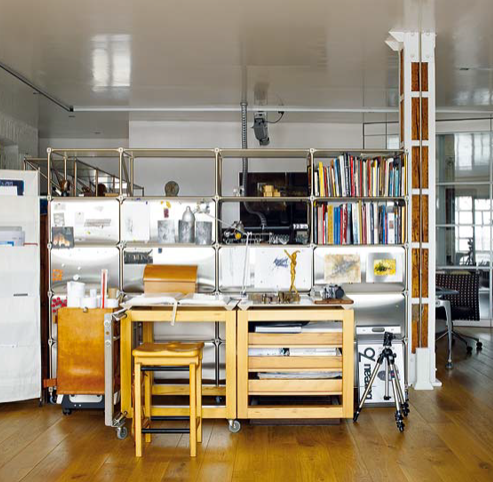 I love the style of lofts, and the idea of living in one. Great post and great photos. Oh I could for sure, especially in the inner city. My last house was really open plan. I agree - a lot seems much more suited for a childless couple or for singles. @mise, I have no idea who makes the stool but I will keep my eyes open! These are beautiful! I could definitely live in a loft (sans children, of course). I appreciate the open floor plan, the high ceilings and all of the light streaming through the large windows. I've always dreamed of living in a loft (and a castle and on the beach...)! I love the desk in the first image. I love the look of lofts. My friends live in a gorgeous loft in SF, and I'm always stunned at how the open space feels. I also really love Loft Life magazine, I end up buying it because the spreads are just so gorgeous. Having said all that, I don't know that I want to live in a loft. I really don't like to sleep with my bedroom door open, so the thought of having NO door is a bit much for me!! i would love open space. I love lofts!!! It's unconditional love I have for them! I'd love to have one in the future! i'd love a loft, but i can imagine i'd be terrified to try to to decorate one! these are wonderful.